Working in collaboration with Seasonal Berries who I’ve joined forces with before on another recipe challenge, now it’s the turn of strawberries to be the star of the show in a healthy recipe. 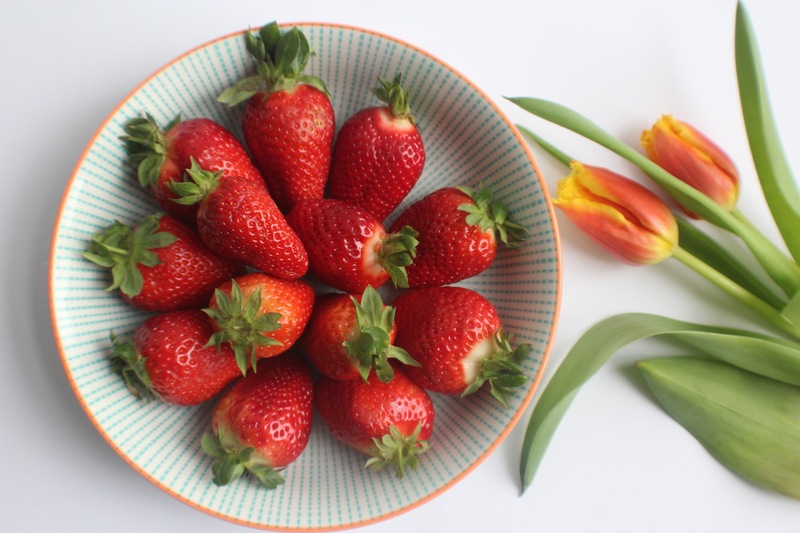 With Spring in full bloom, it’s all about enjoying nicer weather (SOME of the time, at least), lighter mornings and evenings and enjoying many wonderful foods on offer at this time of year – including delicious, good-quality Spring Strawberries from Spain and Morocco. Available in all major supermarkets, strawberries are a healthy, high volume, low calorie food. They contain essential vitamins and minerals which include vitamins C, B6, K, fibre, folic acid, potassium and amino acids and are rich in anti-oxidants including ellagic acid, which helps to protect the skin. More than enough reasons to get creative with them! 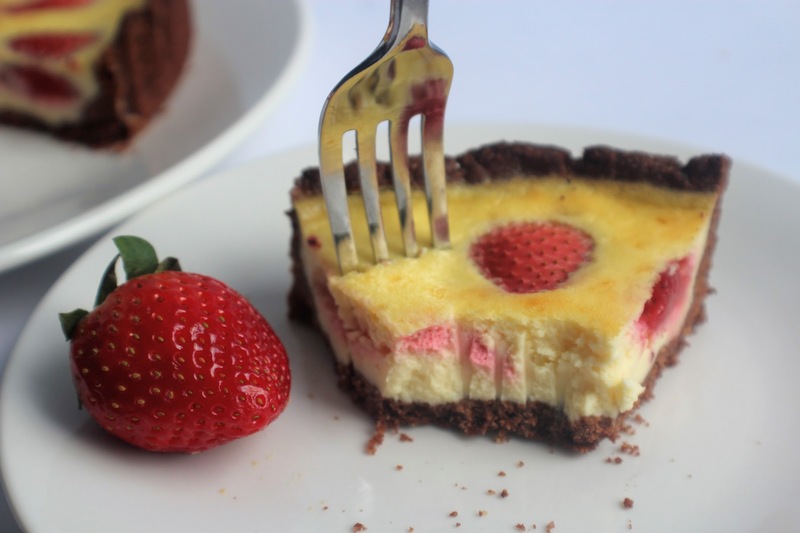 So let me introduce you to this gorgeous dessert recipe, made up of a chocolate and polenta ‘pastry’ encasing a vanilla-infused cheesecake mixture and studded with strawberries. Get this ready in advance and enjoy on a sunny evening when you have friends or family round for dinner for a special, seasonal ending to a meal. Enjoy! Make the pastry: Mix together the flour, polenta, cacao or cocoa powder and stevia in a bowl. 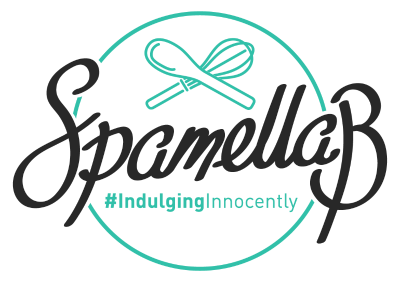 Use your fingers to rub in the butter to form breadcrumbs, then stir in the egg and vanilla and mix well to form a dough. Roll in clingfilm and chill for 30 minutes. 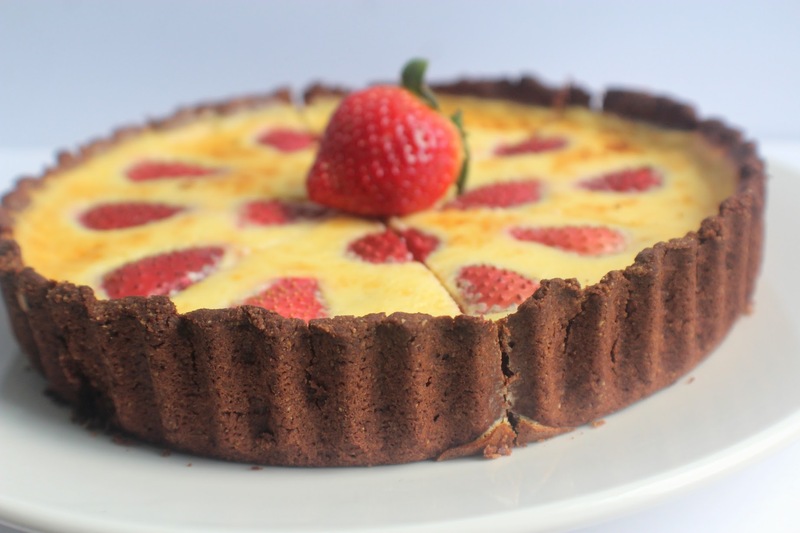 Preheat the oven to 170 degrees C and grease a 22cm loose-bottomed tart tin. Roll the dough out and carefully line it, making sure it covers the base and up the sides. Bake for 15 minutes. 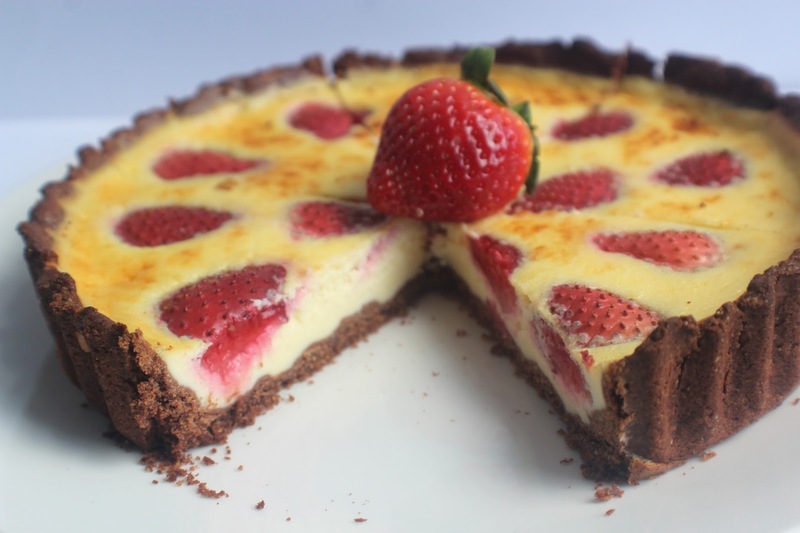 Meanwhile beat together the soft cheese, fromage frais or yogurt, eggs, cornflour, stevia and vanilla until smooth. Remove the baking beans from the tart case. Arrange the strawberry halves then pour over the cheese mixture. Return to the oven and bake for a total of 20 minutes, until firm and slightly golden. Leave to cool completely then chill in the fridge for at least 2 hours. 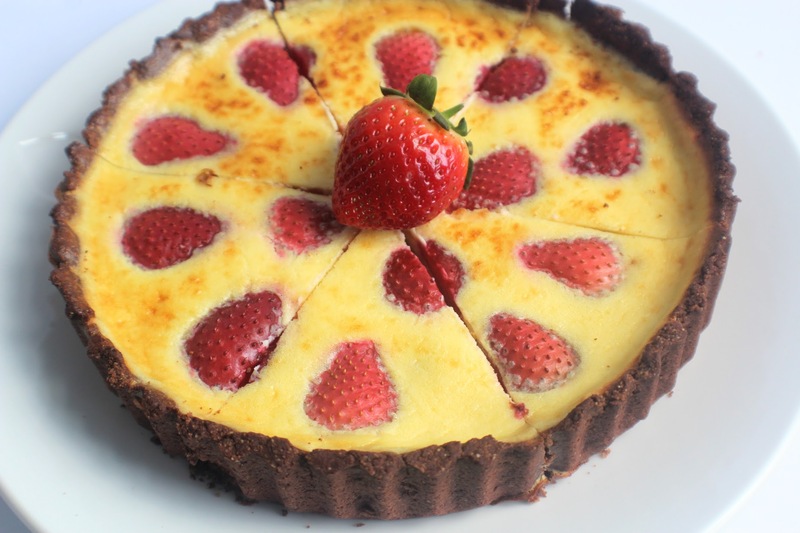 When you’re ready, remove the tart from tin, slice up and serve. 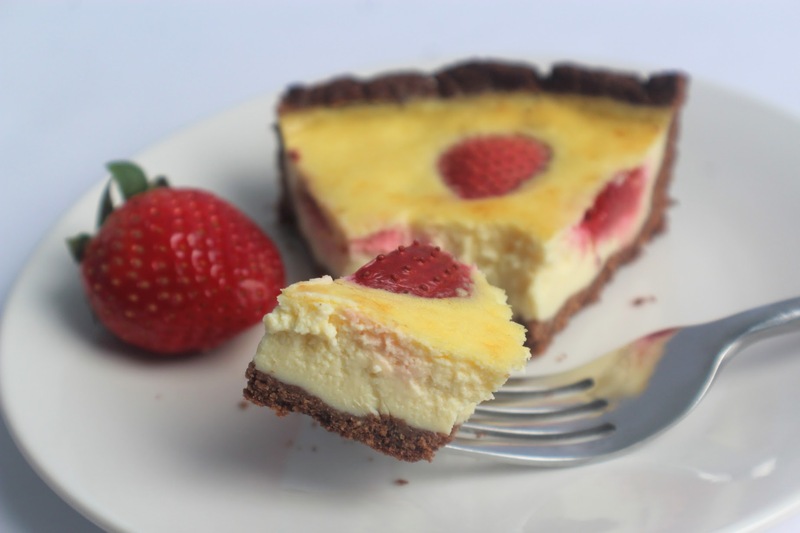 Keep any remaining tart slices in the fridge for up to 3 days. 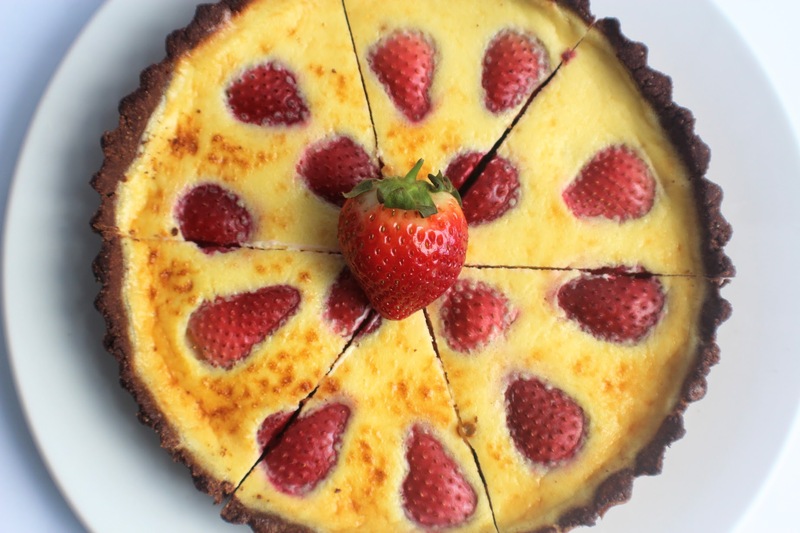 Look out for other #Spring Strawberry inspiration on Twitter and Instagram too!